There are few plant groups that are as diverse as the fuchsia. These exotic looking beauties are firm favourites for their pendant flowers in a wonderful range of colour combinations. Fuchsias may be deciduous or evergreen depending on their variety and growing conditions. They’re versatile too, growing happily in sun or semi shade. These hard working shrubs will flower virtually all summer long, filling borders, beds, window boxes, hanging baskets and patio containers – in fact, they will bring colour to almost any position that you can think of. Pot up fuchsia plug plants using a good quality, well drained compost such as John Innes No.3, and grow them on in warm, frost-free conditions. Trailing fuchsia plug plants may be planted directly into baskets, window boxes and containers. These should also be grown on in warm, frost free conditions until they are well developed. Pinch out the growing tips of each plant while they are still small to promote bushier growth and more flowers. When all risk of frost has passed, gradually acclimatise fuchsia plants to outdoor conditions over a 7 to 10 day period, before moving them (or planting them out) in their final positions. Fuchsias come in all shapes and sizes too, so there is something to suit every garden no matter how large or small. We have a wonderful selection of home grown fuchsias here in the Nursery for you to choose from and our helpful staff are always on hand to advise and assist in your selection. Perfect for hanging baskets and patio containers. Bushy rounded shrubs which are ideal for growing in borders and patio containers. Some fuchsias have a very rapid growth habit and long, lax stems that makes them ideal for training onto large obelisks or tying-in to walls and fences for a spectacular vertical display. 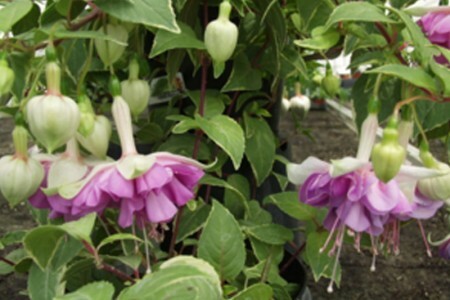 Upright or bush fuchsias can be trained as standards which make superb specimen plants for patio containers. Many people are unaware that the small purple fuchsia fruits are entirely edible – although some are more palatable than others! Fuchsia splendens is often considered to have the best flavour. The citrus flavoured berries have a peppery aftertaste and are best used in jams to sweeten them. Water fuchsias regularly to maintain moist but not waterlogged conditions. Fuchsias that are grown in containers will need frequent watering depending on the size of the container and weather conditions. Hanging baskets should be watered at least once a day during hot summer weather. Fuchsias that are planted directly into borders will become more self sufficient once established. Although many fuchsia plants are naturally floriferous, it is well worth feeding them every few weeks throughout the summer, especially those grown in hanging baskets and containers. Use a soluble fertiliser for best results. Regular feeding will encourage an endless supply of flowers and frequent deadheading will also prolong the flowering period. Half hardy fuchsias tend to be grown as annuals in many UK gardens, but can be easily overwintered in a dry, frost free greenhouse during the coldest months. Many of the most popular fuchsia cultivars for hanging baskets and patio pots are half hardy fuchsias. Hardy fuchsia plants are ideal for growing in sheltered borders all year round. These cultivars range from neat compact varieties such as Fuchsia ‘Tom Thumb’ that reaches just 30cm (12″) tall, up to Fuchsia magellanica which can reach a colossal height and spread of 3m (10’) in ideal conditions. Hardy fuchsias are best planted deeply in the ground to protect the crown during cold winter weather. Further winter protection can be provided by applying a deep mulch of bark chips, leaf mould or straw in late autumn each year. Standard fuchsias will need to be moved to a frost free position during the winter months to protect their vulnerable stem from frost damage, regardless of how hardy the variety is. Upright / Bush fuchsias : Bush Fuchsias are best pruned in spring. Cut back the stems to a permanent low framework. Climbing fuchsias: Prune out the oldest stems in spring when the fresh buds begin to break, and reduce the remaining stems to restrict their vigorous growth to the available space. Previous Post: RHS Chelsea Flower Show!